Here's more on the New England rail revival. 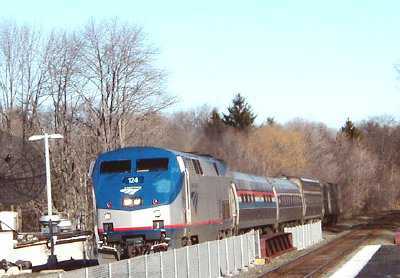 It's mid-January 2002 and Amtrak's Boston section of the Lake Shore Limited, with a very colorful Genesis on the front end, cruises west through the Southboro, Massachusetts, MBTA station, still under construction and slated to open in June 2002. It and stations in Ashland and Westboro have faced delays, but before long they will join the magnificently restored Worcester Union Station and an already opened new station at Grafton on the Boston-Framingham-Worcester line. Construction and service on the line have faced delays best understood only by those expert in the intricacies of Massachusetts politics and the price paid by all public transportation by the endless and inscrutable black hole of a Big Dig in Boston. 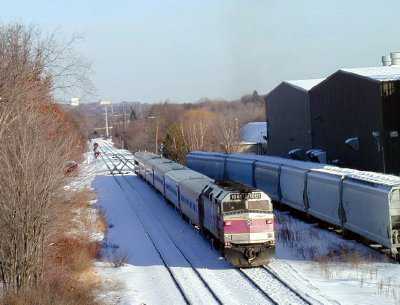 On the right is an MBTA local inbound to Boston, photographed a couple of hundred yards from the new Westboro station, a few miles to the west of Southboro. Lets keep fingers crossed that the Lake Shore still roams these tracks a year from now. The new Canton-128 station shared by Amtrak and MBTA trains is as cold as the winter weather, generally devoid of amenities, and blessed with all the aesthetic charm of a small midwestern airport designed by a team of graduate students. And, wouldn't it be nice if they could figure out how to get monitors at trackside or in the station which show both Amtrak and MBTA arrivals and departures. But there is plenty of parking and lots of trains. 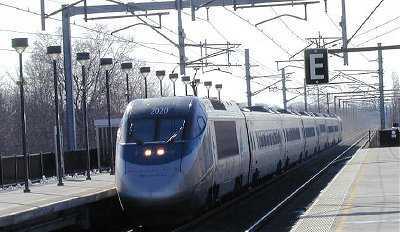 Here, on Sunday, February 3, 2002 is some of the action: Boston bound conventional and Acela Express runs. Packed, on time to the minute, gleaming and pleasing to the camera's eye. North of the border. RDC's back in time. On the left is Canadian Pacific Train #8, a run from Sault St. Marie, Ontario, on to Sudbury and Montreal, photographed in late May, 1963. On the right a VIA Calgary-South Edmonton local, photographed at Red Deer in the winter of 1984. 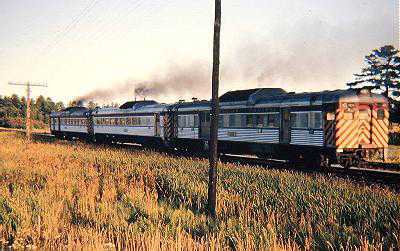 Both trains are long gone, though there is occasionally talk of a Calgary-Edmonton corridor. 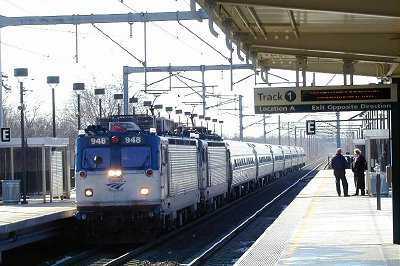 Here are two sides of Amtrak's business. 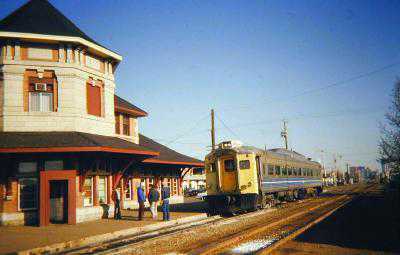 A switcher with a string of mail and express cars, and the Chicago bound Lake Shore Limited, in the Albany-Rensselaer, station. It's April 17, 2002, the temperatures were in the 90s, and if you look through the haze you can see the brand new, but as yet unopened, station in the background. I occupied the Boston sleeper, getting on in Worcester for a journey that would take me across the country and then down California's Central Valley to Bakersfield and Palm Springs. On this night the Lake Shore was full, the service in the sleeping car was tip-top and the dining car was turning out first rate cuisine. There were some of the usual delays and one wouldn't want to give CSX a passing grade for its Upstate New York roadbed, but though this train with its eclectic and somewhat worn collection of equipment was no 20th Century Limited, it certainly made its argument for keeping Amtrak in the long distance business.